Mangaluru, Jan 21, 2019: The Panambur police on Jan 20, Sunday arrested a truck driver on the charge of vehicle theft and took possession of the truck, beloning to Bengaluru. 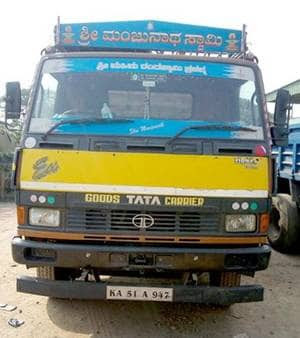 Henjarappa Siddappa of Bengaluru had complained to the Panambur police that his truck driver, Mahesh, had been missing along with the vehicle since November 6, 2018, after he delivered a consignment in Mangaluru. After waiting for about four days, Siddappa arrived in Mangaluru to search for the vehicle. He eventually filed the police plaint. During the course of investigation, the police found the truck near the NITK toll gate at Surathkal. The driver, K.S. Mahesh, 36, son of Shivane Gowda of Kotekoppa, Kanakapura, had allegedly sold two of the four rear tyres. Police inspector K.M. Rafique, PSI M.N. Umesh Kumar and personnel from Panambur station, as well as the Mangaluru North anti-rowdy squad, were involved in the operation, a release said. A foolishness to rob off a truck.Yeh toh hona hi tha?